While I know that the end of summer is approaching fast, I think it’s still safe to say that we have plenty of weeks of hot weather and freshly-picked, sun kissed foods ahead of us. Personally, I am in no rush to wish it away —I love summertime produce! 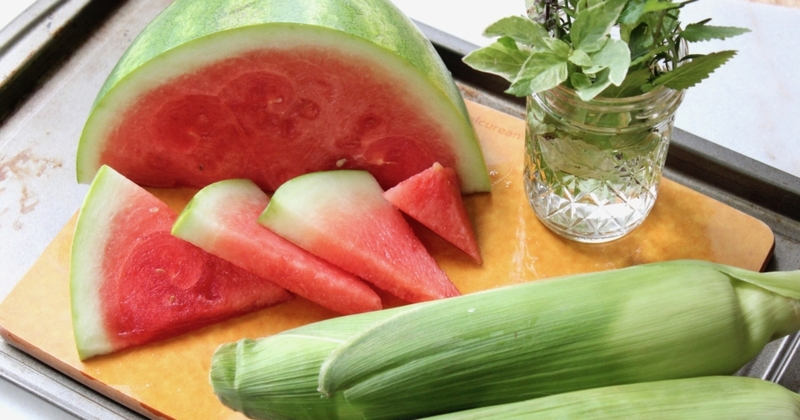 With that in mind, I thought I would share a few of my everyday kitchen hacks that center around some of summer’s most iconic foods: watermelon, corn on the cob, and fresh herbs. Not only are these tips that I personally use every time I eat these foods, but they simplify preparation so much that it encourages me to use these summertime staples even more frequently. They might be simple tips, but I hope they find their way into your prep routines if they aren’t already. Tip #1: Cut your watermelon on a cutting board that it is sitting on a cookie sheet. I hate when I cut into a melon and the juice goes all over the counter, even if my cutting board has a “lip” that is supposed to catch the juices (spoiler alert: those things never work for me). Sitting your cutting board on a sheet pan eliminates that annoyance. It will catch any juice that flows over the edges and makes clean up so much easier. Bonus: this also works for other big, juicy fruits like pineapples! Tip #2: Put your fresh herbs in a small cup of water to store them and they will last days longer than you thought. Whether you just cut too much off of your herb plant for immediate use, or are buying the packaged herbs from the store, putting the stems into a small cup of water will allow the plants to thrive for so much longer than if you just put them in the fridge in a container. I usually just leave mine out on the counter, but you could probably put the cup in the fridge as well and it would keep. Tip #3: The easiest EVER way to cook corn on the cob: in the husk. A. Cut of the strings at the very top and any loose pieces of husk, but otherwise leave the husk on and intact. B. Preheat the oven to 350°F. C. Put the corn in the oven, husks on, and cook at 350°F for about 25-30 minutes. D. Once the husks have lightly browned, remove the corn from the oven and let cool. Then remove the husks and silks from the top. The corn will be perfectly cooked, and all you did was throw it in the oven for a half hour! I’m telling you, this no-fail method makes cooking corn so simple, so hands-off, and has never produced a corn cob that was less than perfect for me. My mom gave me this tip years ago (I think she saw it on a Tyler Florence show on the Food Network). So, thank you Tyler and mom. Bonus tip #4: Also corn-related —cut the corn off of the cob into a wide, shallow bowl. I really like adding fresh corn kernels into salads in the summertime, so I will often cook the cob (as above), let it cool in the fridge, and then cut the kernels off into a bowl. If you do this on a cutting board, you will more than likely have corn flying all over your kitchen counters. Instead, just prop the cob upright into a bowl, use a sharp knife to cut down the sides, and avoid the mess! I hope that these tips help you step up your summertime food game while you still can. Let me know if they helped you!